Number one: Play 60 minutes of football. All in the same game. Number two: If no number one, play 30 minutes of really good football. Number three: Make sure those 30 minutes happen in the second half. 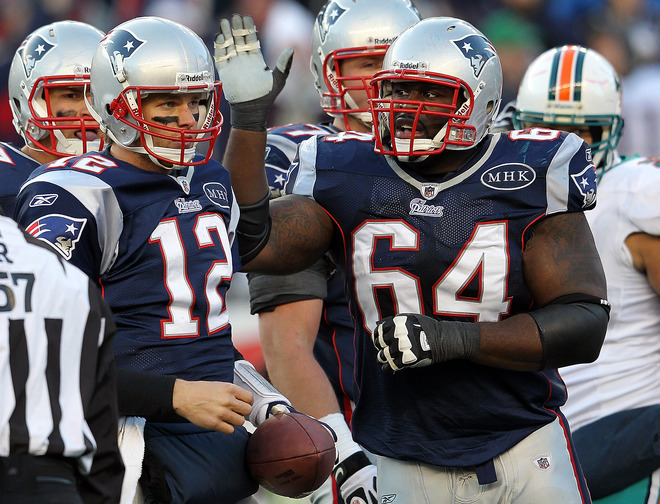 The Patriots overcame a 17-0 deficit to avoid drowning against the Dolphins in a 27-24 win. With a first-round bye in place, New England hosts Buffalo with an eye on the number one seed in the AFC. Line, Please? The Patriots’ offensive line had more switches than a Dickens-era schoolteacher, ending up with rookies Nate Solder and Marcus Cannon at left and right tackles, respectively. Looks like both guard Logan Mankins and tackle Matt Light will be held back until the playoffs. The rookies and new Patriot Donald Thomas (left guard) deserve praise for gelling in the second half, but Buffalo’s defense may not prove as kind to the newbies. What’s Blue And White And Runs All Over? Speaking of rookies, nice work by running back Stevan Ridley. He seems to possess a burst that BenJarvus Green-Ellis doesn’t, as well as some serious bulk that running back/pixie Danny Woodhead lacks. In short, the more carries for Ridley, the better. Ochocinco Para Uno: When New England signed Chad Ochocinco before this season, they had hopes of developing him into a complementary receiver. Not so much, as Ochocinco caught just one pass, again. He has 15 catches for 276 yards and one TD. Ochocinco has set our expectations at this mediocre level, so if he has a game with a few catches and a touchdown, we’ll be first in line at the parade. Don’t Call It A Comeback: Well, we’re not sure what else you could call it. Down 17-0 at the half, New England scored 27 straight in the second half to pull away from the Dolphins. Earlier this season at Buffalo, the opposite occurred, as the Pats failed to hang onto a 21-0 lead before losing on a last-second field goal. What Pats team shows up in the first quarter this week? Will they need some more comeback magic? Should Welker sit out this game? We wouldn’t mind it, but we wouldn’t expect it, either. Call Us New Englan – Without the “D”: Sure, the Patriots’ defense held Miami to only seven points in the second half. Yes, they recovered a fumble and notched an interception. But you have to contrast these turnovers with the fumbles they forced at Denver. The Patriots got into position to make strong plays and strip the football at Mile High stadium two weeks ago. Against Miami, they fell on a botched snap and caught what amounted to a punt by Dolphins QB Matt Moore (Devin McCourty was behind the receiver by two steps and mistimed his jump to the point where he almost missed the ball. Maybe the kid needs glasses). When they play better teams in January, New England will need better play from their defense. Less luck, more pluck. Planting The Seed: Win or lose, New England gets to rest their linemen, put in some fancy plays for Ochocinco, and maybe – maybe – settle down their defense. Either way, not too bad. A serious note from me about the passing of a dear friend. Father Tom Fleming lived and worked in and around Boston for over 50 years, leaving the area only when he was a military chaplain in Vietnam. Father Tom has been a part of our family since the 1960s – among many other connections, he baptized me and married me to my wonderful wife. He will be missed.